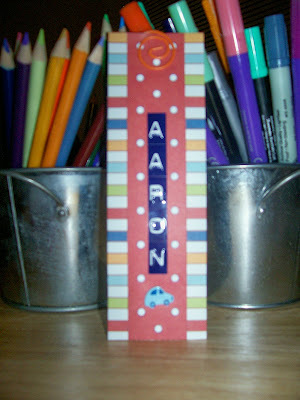 Challenge #8 over at the 18 Days of Angelosity was to create a bookmark. Mine is super simple, but it will do the job! Aaron loves to "read", and I like to read to him daily, so this will come in handy for us! The PP is a scrap from Scenic Route I believe. I found the little orange spiral clip in my stash. The letters are Sticko and that cute little car brad is from Queen and Co.! Yeah! You've been busy! Kids love bookmarks...especially persobalized ones. I bet this was a hit!